Joan Kelleher,, Local Enterprise Office Mallow presenting the award for the best stand and interview to the team from the Nagle Rice Doneraile. 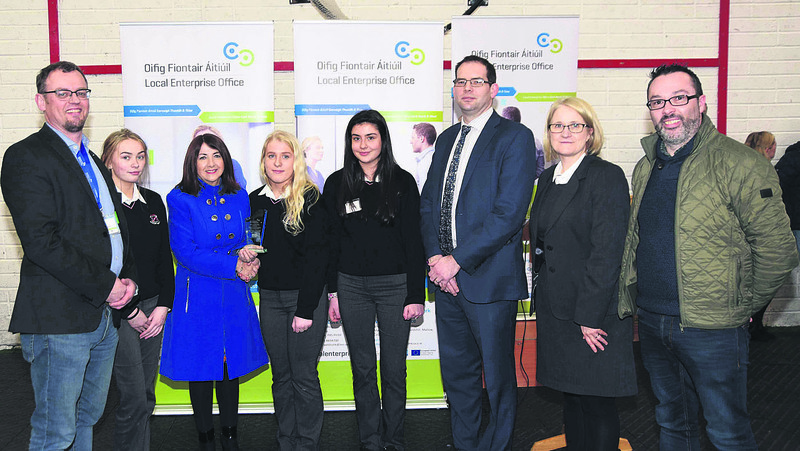 Over 200 students from second level schools all over North Cork took part in the final of the Student Enterprise Programme run by the Local Enterprise Office Cork North and West, at Mallow GAA complex on Tuesday, 12th March. A total of 59 mini-companies from second level schools all over North Cork put on display products they have produced since the school year began in September. The event was organised as part of the National Student Enterprise Programme run by the LEOs across the country. To reward their effort, the LEO put up a number of trophies and the competition was fierce. The Best Overall in the Intermediate category went to ‘Wrap it Up’ from Presentation College, Mitchelstown, and winner in the senior category was ‘Smooth Remove’ from Boherbue Comprehensive School. ‘Wrap it Up’ made re-useable sandwich bags from oil cloth, while ‘Smooth Remove’ created a device to assist you to remove your boots or shoes. Both showed exciting innovation and had strong sales. There were a host of other prizes on the day, and ‘Temptations’ from Nagle Rice Doneraile, and ‘Target Market’ from CBS Charleville picked up awards for the quality of their display. 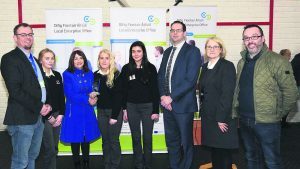 ‘Hang ‘em Up’ from Coláiste Mhuire, Buttevant, and ‘Better Slate Than Never’ from Boherbue Comprehensive School received awards for their sales technique. ‘Quick Reel’ from CBS Charleville and ‘Nok Nok’ from Coláiste an Chraibhín Fermoy, received awards for Innovation. “Blue Locker” from Loreto Fermoy, and ‘Covet’ from Scoil Mhuire Kanturk, received awards for the Best Business Plan. ‘Stresstopia’ from Coláiste Chraoibhín Fermoy and ‘T-Holder’ from Scoil Mhuire Kanturk received awards for their marketing campaigns. Judges on the day were Elaine Murphy of AIB, Donal Murphy of Dunlouco, Cathy Fitzgibbon of the Culinary Celt, Willie John O’Flynn of FDC and Associates, Anthony Russell, LEO, Cork City. All were very impressed with the standard of entry and agreed it was difficult to pick the winners from the depth of talent on display. The Student Enterprise Programme is a national initiative which instils entrepreneurial skills in young people, and the showcase gave the students experience at putting together a presentation stand, pitching to judges and honing their sales skills. For more information regarding this initiative, visit www.studententerprise.ie.